It has been accepted that Pothana lived in the 14th/15th Centuries. He was a native of the village Bammera (in today’s Warangal District). 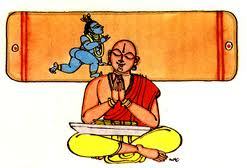 He is believed to be a Sahaja Kavi, the one who got to imbibe the skill of poetry by his own nature. With the above poem which served as a humble disclaimer, Pothanamatya also asserted his creative liberty in narrating the sequences of the Bhagavata Purana. The freedom he asserted about his literature can also be seen in the way he led his life. He stuck to the profession of farming, a lifestyle strikingly different from that of his peers who sought out the patronage of rulers. His literary predecessors like Adi Kavi Nannayya, Tikkana Somayaji, Srinatha, etc enjoyed the patronage of their contemporary rulers. Scholars opine that their works like Andhra Mahabharatam also reflected the life and greatness of the rulers who patronized them. I do not mean to belittle their greatness as for all we know; the rulers in those turbulent times did deserve the accolades. Pothana himself has taken a lot of care to acknowledge the literary giants who served as his inspiration. But carving his own niche within the congregation of scholars, Pothana refused to dedicate to anyone else, his work other than Sri Rama who we understand is his ishtadaiva (though he belonged to a Shaivite family) . He did not accept even a Dammidi (~ 1 millicent of Ameican standards) as a token of patronage from anyone. Recite I shall, this Bhagavatam. But the one who drives me to recite is none other than the Lord Ramabhadra. When my recital can destroy the materialistic mirages, why should I recite any other story? For a Satkavi (Poet in pursuit of truth), it is better to remain a farmer or depend on the fruits and roots available in the forests to feed his family rather than dedicate his work which is like his own daughter of blooming youth to undeserving hands and eating out of the fruits of the unholy dedication. Pothana was born in a family that followed Veera Shaivism. 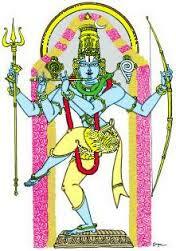 He however chose Rama as his iShtaDaiva. The balance is seen in his poetry where he describes Shiva. This is one characteristic contrary to conventional puranic recital where the deity of subject is depicted as the supreme and all others as subservient/inferior to him or her. The poem below is the very second poem of the epic where he praises Lord Shiva. యమ్మ, కృపాబ్ధి యిచ్చుత మహత్త్వకవిత్వ పటుత్వ సంపదల్. My knowledge of the Andhra Mahabhagavatam is too less to analyse each and every aspect of the epic. But from my memory, the episode of “Gajendra moksham” stands out of the rest. 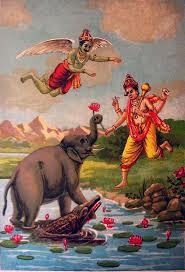 The prayer of Gajendra to Vishnu starts with some amount of agnosticism trying to analyse the characteristics of the Supreme Being (Which I feel is jignaasa) and gradually progresses to the agonized call of the devotee in trouble (aarti). Notable aspect here is what Pothana writes about the response of Vishnu to this prayer. There are multiple legends around this single poem. But it reflects the poet’s liberty to describe the eagerness of Lord Vishnu to save his devotees. Even today during informal conversations, we use this poem to tease someone who abruptly rushes out of a gathering without telling anyone about the reason. The other episode which is dear to me is the one where gopikas complain about the mischiefs of child Krishna to Yashoda. As it was a lesson prescribed in my High school, I remember learning about the variety of vocabulary Pothana used to address a woman. Ambhojakshi (Lotus eyed), Vimalendu mukhi (one with the face like a spot less moon), Lathangi (One with a body as slender as a creeper), Manjula Vaani (The one with a soothing voice), Trilokaabhi Raama (One who delights the three worlds) are some of them. Needless to say we, the girls in our class spent that year using the same words to playfully address each other. A Very Special thanks to Sri V Sambasiva Rao garu for his precious inputs and transliteration of poems. This entry was posted in Indian History, Indian Poets, Telugu. Bookmark the permalink. Good article by Swaroopa gaaru …. పోతనామాత్యుడు కూడా శ్రీ కారం తో మొదటి పద్యం వ్రాసాడు ” శ్రీకైవల్య పదంబు జేరుటకునై …. వేదమనే కల్పవృక్షం నుంచి భాగవతం అనే ఫలం జారిపడింది అని పొతనామత్యుడు ” వేద కల్ప వృక్ష మిగిలితం …. As the writer mentioned it is not possible to write in one article about Shri Bommera Pothana ….I advice her to cover few more excellent poems in another article …..may be “ala vakunta purambuloaa…. చాలా బాగుంది. సాయి స్వరూప్ గారు. చక్కగా వివరించారు. అభినందనలు. చిన్న సందేహం ప్రాసాక్షరాలు బొద్దు (బోల్డు) గా ఇచ్చారు బాగుంది. మరి యతి ప్రాసలు జంట కదా. యతి స్థానాలు కింద గీత చూపలేదా లేక సాంకేతకంగా అనువు కాలేదా. Faced a problem with formatting sir. That’s why could not highlight yati sthaanam. Will figure out and edit.